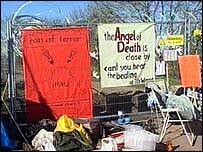 A group of peace protesters has launched legal proceedings against Gloucestershire police, claiming they used anti-terrorism laws to prevent demonstrations against the war in Iraq. 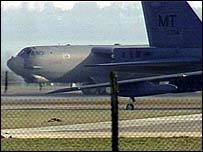 The complaints centre on RAF Fairford, where American B-52 bombers were based during the conflict. None of the protesters who demonstrated at the airbase were charged with terrorism offences but they say their human rights were breached. The pressure group Liberty is calling for an inquiry into the use of section 44 of the Terrorism Act 2000 at the base. Officers were granted powers under the legislation to stop and search vehicles and pedestrians in the area near the base between 7 March and 27 April. Liberty wants the Commons Home Affairs committee to mount an investigation into why the powers under the Act were used on demonstrators. It says the inquiry should also look at the policing of other demonstrations at military bases during the conflict. One of the people the group says was stopped under the Terrorism act was 11-year-old Isabelle Ellis-Cockcroft, whose father David Cockcroft is taking legal action claiming a breach of human rights. Isabelle told the BBC: "We were just walking along the road and they stopped us. I did not have a full body search because there was no woman officer there. "They asked what was in our pockets, wrote down our descriptions and checked a backpack and a bike we had with us. "They said they were stopping us under the Terrorism Act, but I'm not a terrrorist." David Drew, the Labour MP for Stroud, whose constituency neighbours the base, said: "I feel that the anti-terrorism legislation was used inappropriately. "It was made unnecessarily difficult for people to carry on with their right to protest peacefully." A spokesman for Liberty said: "We are not in the least critical of the police, the police were simply carrying out orders." Between 1 March and 30 April, 61 people were arrested at the base - of these 27 were charged with public order offences, according to Liberty. A spokeswoman for Gloucestershire Police said: "We are aware of the report but are not currently in a position to comment for legal reasons."